We went to South Africa in June 2013. So many amazing sights! I’ll try to share some of them using digital video and photos – but I’d highly recommend a visit. 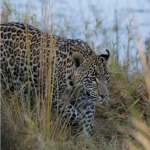 I was surprised at the guttural sounds made by a female leopard as she patrolled and marked her territory. When I think about it, it makes sense but it was still a shock to hear those deep sounds. But you can listen for yourself in the video below. We start with some gentle bird sounds and then get to hear the leopard announce herself. Note: the beeping camera sounds are not natural and I’d definitely recommend turning off all notifications when photographing nature.